← Nature Island Challenge-Go Team USA! The Dominica News Online announced a great new resource this morning! The author of Bradt’s travel guide to Dominica, Paul Crask has just launched a website to help us navigate Roseau. It is called the Roseau City Guide. Let me tell you why I am excited about this. Roseau is one of those places that is packed with so many shops, and unless you visit there frequently, it’s hard to know where to find things you are shopping for. This website is going to help with that. We all know the major establishments, but many times the gems are found in the small, random, establishments that don’t even have a sign outside their door. I think Crask’s website is a step in the right direction – helping visitors and residents alike to focus on what Dominica has to offer. Living on the northern end of the island makes getting to Roseau a concerted effort. For people in the Ross community there is a an issue of time available to make the trip-an hour each way of the trip plus time you need to shop. I’ve met students in 3rd semester that still haven’t made it to Roseau even once, and I understand why. I have to say though, getting out of Picard every once in a while, is a great way to reset yourself. The university offers a free ride to Roseau every Saturday (except during semester breaks) which is good to take advantage of. You leave campus by 8:30 and return by 1:00. Students will study in the transport too to minimize their time away from the books, which is do-able as long as you don’t get motion sickness. Last week when I was in Roseau I discovered a place called Beauty Wise which is right by KFC. It was like walking into Barbados. How long has this store been in existence? A year. I’ve never heard of it. It’s a place for the ladies for sure-health and beauty products, make up, hair products out the wazoo. The store was clean and well organized, the staff super helpful…really nice shopping experience. 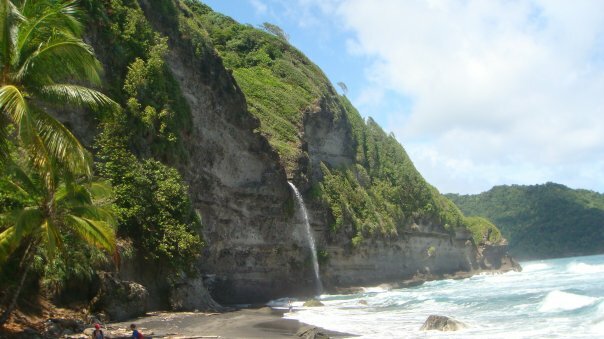 My point is…this is how I experience Dominica, by getting out there and wandering around. You can usually find what you need here and save yourself from importing stuff if you take the time to find out what the local resources are. I know, I know, students don’t have the time to wander around, but a planned study break in Roseau is worth the effort, especially for the Rossies living in Roseau. Now, back to why I’m excited about this website. Dominica, to me, seems very hidden from the rest of the world. It’s not the kind of place that appears on international news sites or on TV. I feel like the more resources we can get out there to show the world how beautiful Dominica is, how unique the culture is, how talented the artists are etc., the better off the world will be. Dominica offers a very simple way of life to a world that’s lost itself in busyness. For those of us from the United States that get to spend a season of our lives here, Dominica has a lot to teach us. So, check out the Roseau City Guide when you are ready for a staycation. I highly recommend Ft. Young Hotel, Le Petit French Bakery, the Roseau Cathedral, and Jack’s Walk. Find some time to enjoy the island, after finals of course! This entry was posted in Businesses in Dominica, Creole Culture, Dominica, Dominica Excursions, Festivals in Dominica, Food in Dominica, Grocery Shopping in Dominica, Island Life, Restaurants in Dominica, Roseau, Ross University School of Medicine, Shopping in Dominica, Things to Do in Dominica, Travel & Dominica and tagged Beauty Wise Inc., Bradt Travel Guide to Dominica, Paul Crask. Bookmark the permalink. The trip will cost 9 EC each way. Try to carry exact change or use small bills. You can catch a bus by standing out in front of Pelligrino’s Restaurant by the bus stop (or really anywhere on Robert Ross blvd). Look for vans/taxis on the road with an “HB” license place in front and flag them down. Ask them if they are going to Roseau. It’s pretty easy to do. If you need to catch a transport around 7 or 8 am it’s best to go to the Portsmouth bus station and get on the transport there. Once the semester starts, Ross will offers free trips to Roseau on Saturday mornings leaving from the library. how do i travel from ross to roseau by bus?? and how much would the trip cost?